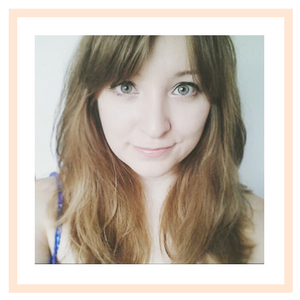 I took a break from uni this weekend and popped home to celebrate a birthday and enjoy the snow! 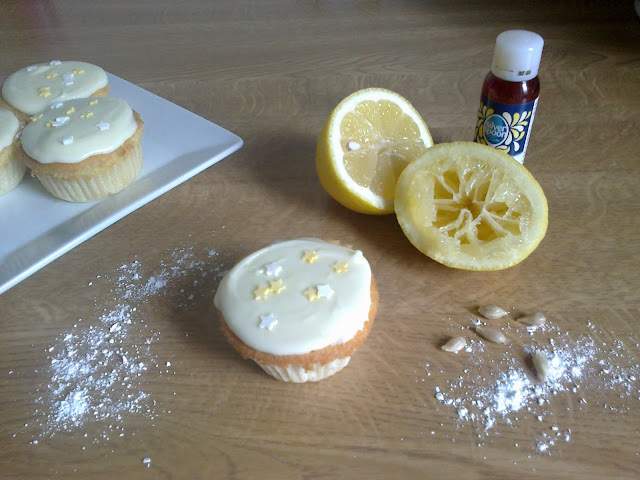 These lemon cupcakes were part of an afternoon tea that I made (other goodies included shortbread and macarons). I really love lemon; whether I'm eating a drizzle cake in the garden with a book in Summer or making the most of a sore throat and indulging in endless cups of hot honey and lemon whilst snuggled up on the sofa. These cupcakes were the product of my own creation (and many lemon cake recipes I've used in the past)! 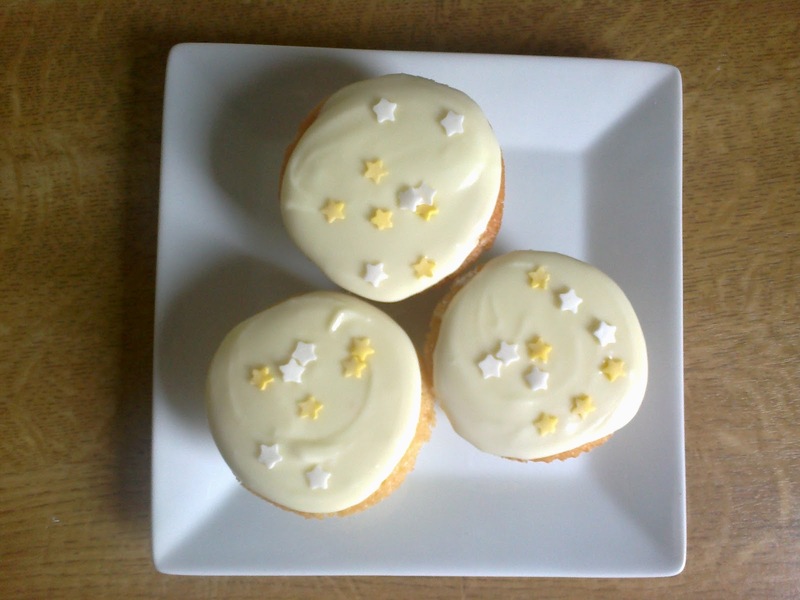 A note of caution, these are really very lemony and may not be to everyone's taste - but that's just how I like them! Beat the eggs in a small bowl or mug. Add the juice of half a lemon and mix in. Add a splash of milk to the mixture. The mixture should be a little runnier than normal cupcakes. Spoon into cases and bake for 15-20 minutes, or until they are golden brown and spring back when pushed in the centre. While the cakes are in the oven, add the sugar and lemon juice to a pan and heat gently. Once combined, take off the heat. When the cakes are out and on a wire rack to cool, prick each one with a cocktail stick or fork and spoon over the syrup. To ice, mix together the juice of half a lemon and icing sugar. I just keep adding more icing sugar until I have the correct consistency! Add in food colouring until you have the shade of yellow you are after and spoon onto the cakes. 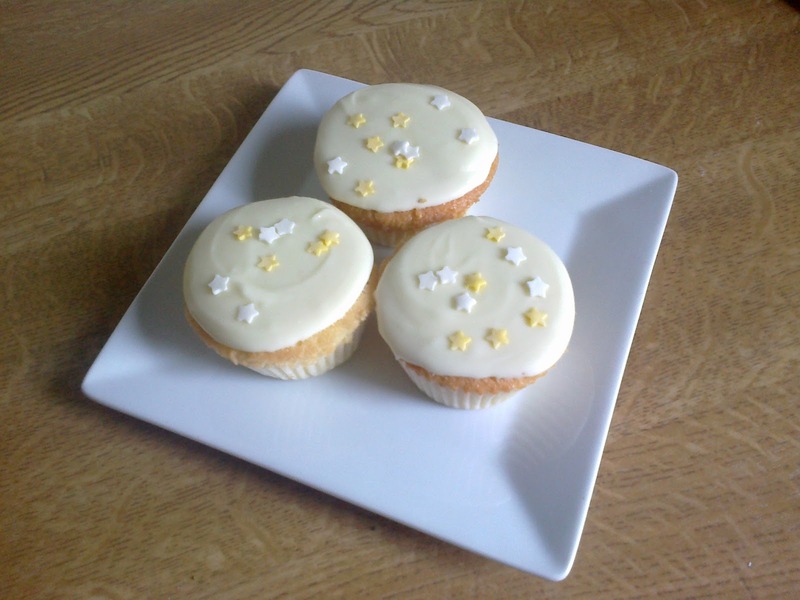 Finish with yellow and white sugar stars.